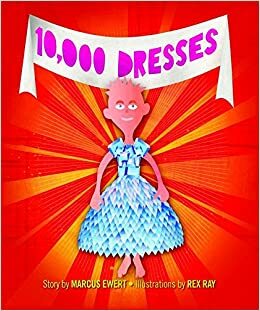 Marcus Ewert’s 10,000 Dresses is the story of Bailey, a transgender girl whose family members insist she is a boy even though she knows she’s a girl. Rex Ray illustrates the text, providing the reader access to Bailey’s psychic life by depicting her dreams and thoughts. The only disappointing part of the text is the orange-tint to Bailey’s skin, a color that connotes quite differently in 2018 than it did upon the books original publication in 2008. Like many children’s books, Ewert tells his story through repetition. Every morning when Bailey wakes up she tells a family member about the dress-wearing dream she had the previous night. Every morning a new family member dismisses her dream, ignores her attempt at self-definition, and tried to silence her. The repetition of rejection, painful for the reader, is an important part of the story. It illustrates the tenacity of queer desire, which dwarfs the queer child’s need for family acceptance; a point likely to make some readers uncomfortable, but one I suggest maximizes the book’s queer potential. In her first dream, Bailey tries on a dress made of crystals. Beautiful sight and sound delight her as the crystals make music and rainbows. Bailey shares her first dream with her mother, who is depicted clipping coupons in the kitchen. As Bailey describes her dream, her mother adds an occasional and distracted “uh-huh.” She, however, becomes animated when Bailey asks if she’ll buy her a dress. Her mother declares that boys don’t wear dresses. Bailey’s response is hauntingly expressed by Ray; the confident girl in Bailey’s dreams turns into a slump-shouldered child with downcast eyes. In her second dream, Bailey returns to the castle and tries on a dress made of flowers. Bailey shares her second dream with her father, who is depicted manicuring the lawn. Bailey’s father, like her mother is only partially represented; they both remain faceless throughout the text, bodies often stretching out of the frame as they tower over their daughter. They are caricatures of cisgender heterosexuals playing their sanctioned roles. Bailey asks her father if he can grow her a dress. Her father refuses, telling her to leave and demanding she never speak about dresses again; her disappointed response mirrors her reaction to her mother’s rejection. In her third dream, Bailey returns to the castle where she tries on a dress made of windows. Instead of depicting the inside of a house, these windows open to the world. Bailey shares her third dream with her brother. He calls her gross and threatens to kick her. This time, Bailey responds by running away from home and her brother’s threat of violence. At the end of the block she sees an older girl, who we soon learn is named Laurel. Laurel sits on a porch with needles, thread, and old sheets. Bailey approaches the older girl and soon learns that Laurel has all the materials she needs to make a dress, but no vision. Of course, the two work well together, Bailey’s head is full of visions of dresses. Laurel is given a name and face. She has dimension for the reader, and for Bailey. The final image is of the girls wearing the dresses they worked together to make. I love this book. I especially love these dresses. They are queer objects of desire that celebrate femininity, connecting it to creativity and pleasure. Even more, Bailey desires the dresses far more than acceptance from her family members. In fact, they are depicted as little more than a means to an end as Bailey asks each in turn to help her access a dress. Importantly, if her mother or father were to deliver her dream-dress they would represent the permitting-parent-gatekeeper; a trope that appears in many queer children’s picture books in which gender expansive children are subordinated to adults and require parental permission to be themselves. Ewert’s having none of it. Instead, he envisions a beautifully interdependent relationship tethered to reciprocity and shared world-making. Laurel and Bailey need and want each other. This is one of the most queer-affirming children’s picture books I’ve stumbled across. It may make for an uncomfortable read, but it foregrounds the reality that sometimes parents are disappointing, a message many young LGBTQ* persons can surely identify with.